My own journey with developing who I was as a person starting 16 years ago. I watched Tony Robbins on TV, then I did a workshop with him. I remember walking out of his seminar thinking OMG there is a whole other world out there and so much of me that has not been discovered. I was excited, and that was the start of my journey, I was off! I hope I can join you on yours. I have always wanted to be the best version of myself and that meant looking at the parts of me that I didn’t want to own because without accepting them as they were, I knew I wouldn’t be a whole person. Making changes in life is easy – the difficult part is actually making the decision to change. When that has been done, then the rest just flows. Personal development is the conscious choice to improve one’s life to become a better person and to grow as an individual. It’s taking steps to better yourself, such as learning new skills and overcoming negative habits. There are many aspects of a person’s life such as in Maslow’s Hierarchy of Needs (see below). 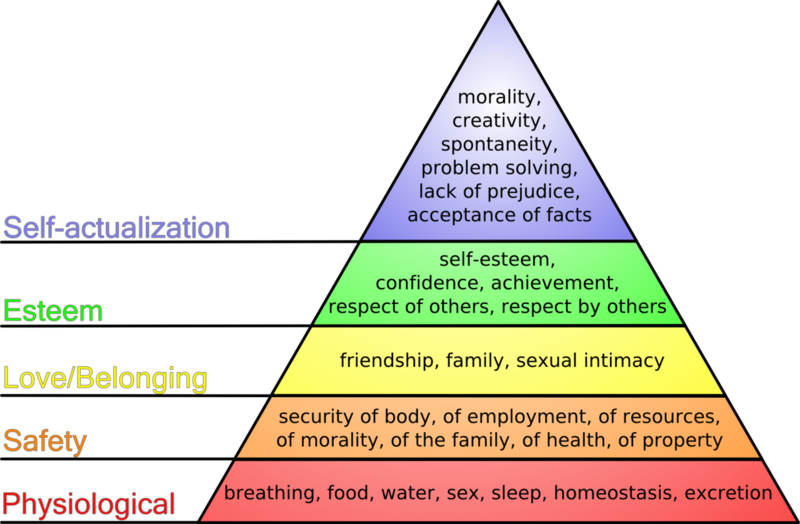 We start off at the bottom of the pyramid with our basic needs such as food and water, followed by security and safety, then we keep going up the pyramid. Why do some people go through life being happy and content getting all their needs met while others struggle to get their basic needs met? This depends on the environment to which we belong. The environment is either growing and thriving or it’s on shutdown and survival. Our environment is our family – are they encouraging and loving or angry and unsupportive? Our friends – are they positive and caring or are they into addictive behaviours and put us down? I think you get the picture. Other parts of our environment are the workplace, where we live, what we think about being healthy, is what we eat and drink going to benefit our bodies. Our environment is either healthy for us at a mental, emotional, physical or spiritual level, or it’s not and it’s up to yourself to be aware of what is not working for you, and what doesn’t serve you. Work out how do I actually reach the top of the pyramid to live a happy and fulfilled life that I consciously create?